You're driving along and you notice your fuel gauge is on E. You stop at a gas station and fill 'er up – and instead of gasoline you get a tank full of water. It happens. But if you paid cash and didn't get a receipt, your day just got uglier. I wrote a piece last week where I suggested it was a good idea to save receipts for the supplies you use if you are the sort who changes his or her own oil in one's new car. I had a couple commenters who suggested I was insane to make such a suggestion. After all, who saves receipts? Well, I've known people who saved them religiously and it benefited them and I've known some who ignored receipts and it cost them. One client of mine always got receipts for his gasoline even when he went inside and paid cash for his fuel. 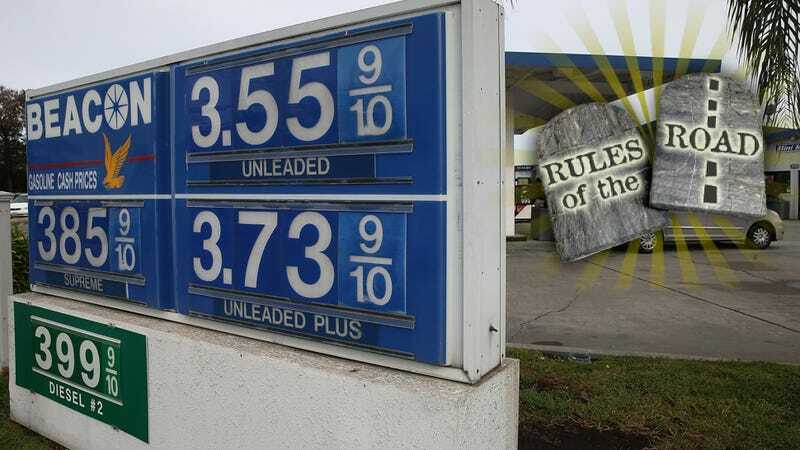 One day, after buying gas at a station he did not normally frequent, his car died. He had it towed to a mechanic who told him that his gas tank was filled with water. It was going to be an expensive fix. When my client went back to the gas station, he found he was not alone. There were others there who had also gotten tanks full of water and were upset. The manager was taking down information from all of the disgruntled folk in front of him and he would ask each one, "Do you have a receipt?" Some did, some didn't. My client did. While some might object to the manager's question, you have to put yourself in his shoes. Once word got out the station might be refunding money to anyone who bought gas there, a swarm of people who had never set foot in the station showed up demanding compensation. It's just how things are. In this case, the station did not make good on my client's claim and we were forced to file suit. We eventually obtained a judgment, which I suspect the station owner's insurance company viewed as a way of weeding out the lesser claims. And, as you might guess, the entire legal action hinged on a single slip of paper – the receipt my client religiously obtained each and every time he bought fuel for his car. The other consumers without receipts? I bet many of them lost their claims — if they bothered to file them at all — because they would have a hard time proving they bought gas from the station on that day. I've been asked if I practice what I preach. On this one, Yes. Whenever I buy gas it is usually with a card at a pump and when it asks if I want a receipt, I tell it Yes. I take the receipt and toss it in a little space in the center console where it usually sits until I throw it away – at the station the next time I buy gas. And I even get a receipt on the occasions I pay with cash. Why do I do this? Because I have represented three people who have had this happen to them at three different gas stations. Am I paranoid? Google the phrase Gas Station Sold Water. You'll find this guy who had it happen this past November. Or this woman, who got a tank full of water in April. Or a bunch of people in New Jersey. And this woman in Colorado. Or the news station that investigated and found the problem at several stations. Or the time Chevron was fined more than a quarter million dollars for selling gas contaminated with water. As you peruse those articles, notice that the repairs are not cheap, often ranging in the $1,000 to $2,000 range, although a few stories cite higher figures. You may also notice that one of the problems is that gas stations commonly have water in their underground storage tanks and various states have different standards for how much water they allow in tanks to be in compliance with state law. Some experts suggest that you should never buy gas at a station while gas is being off-loaded from a tanker into the ground. The action of the incoming fuel can rile up the contents of the underground storage tank and get water pumped up which normally is not supposed to happen. But in the instances above, it often seems that the stations just screwed up and got too much water in their tanks. If you are a receipt-saver, or if the foregoing prods you to become one, the receipt will be Exhibit A should you need to chase a gasoline vendor for vending you a tank full of water. If you did not get a receipt and you paid cash, do you have witnesses? The station might have security cameras, assuming they didn't accidentally malfunction at the exact same time the water was being sold. But you will notice that your job just gets harder without that little piece of paper. And, in case you are attorney-averse, you might not need to lawyer up. Depending on your state's small claims threshold, you may be able to file and handle this action yourself with a small claims court action. Give your local courthouse a call and ask. And when you go in to file the paperwork, know that the most important piece of the case is going to be the receipt. Steve Lehto has been practicing law for 23 years, specializing in consumer protection and Michigan lemon law. He wrote The Lemon Law Bible. He also wrote Chrysler's Turbine Car: The Rise and Fall of Detroit's Coolest Creation and The Great American Jet Pack: The Quest for the Ultimate Individual Lift Device.